The City of Richmond is seeking community input to develop its Climate Action Plan, which will serve as a roadmap for the City to reduce greenhouse gas emissions and mitigate the impacts of climate change on public health, infrastructure, ecosystems, and public spaces in the community. The plan is unique in that it will build upon Richmond’s General Plan and Health in All Policies Strategy to continue making Richmond a healthy, vibrant, and equitable place to live. 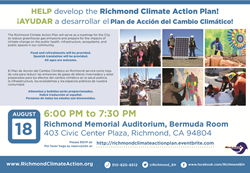 Community residents are invited to attend an upcoming workshop to help the City of Richmond develop its Climate Action Plan, which will serve as a roadmap for the City to reduce greenhouse gas emissions and mitigate the impacts of climate change on public health, infrastructure, ecosystems, and public spaces in the community. “The plan is unique in that it will build upon Richmond’s General Plan and Health in All Policies Strategy to continue making Richmond a healthy, vibrant, and equitable place to live,” said Richmond City Manager Bill Lindsay. For the last two years, the City has been working in close collaboration with the UC Berkeley’s Department of City and Regional Planning with Professor Jason Corburn, and Y-Plan Center for Cities and Schools Director Deborah McKoy and 250 Richmond High School students to update the City’s greenhouse gas inventory and gather best practices and stakeholder input for the development of a Climate Action Plan. The City is working to complete the Climate Action Plan by the end of 2015 and its been identified as a top priority of the Mayor and City Council. The Plan will establish goals for climate action in Richmond that link and address relationships between climate change, public health, economic development, and equity. It will establish policies and actions to reduce greenhouse gas emissions, improve community health and maximize co-benefits, while setting emission reduction targets consistent with State and regional targets. The Plan will also support community resiliency. To RSVP for the workshop, go to http://www.richmondclimateactionplan.eventbrite.com. For more information about the plan, visit http://www.richmondclimateaction.org.